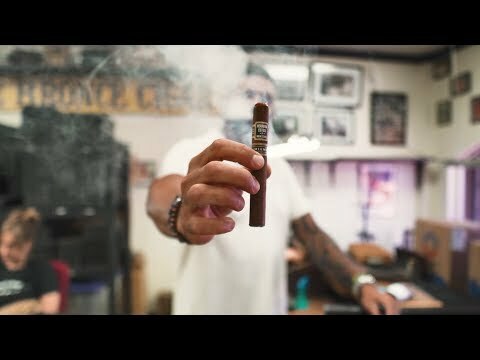 Released with a new branding design in 2018, Herrera Estelí Miami cigars display the expert craftmanship of the El Titan de Bronze Factory on Calle Ocho in Miami's Little Havana district. It's also the factory founded by Willy Herrera’s family, and where Willy learned his blending and rolling skills. As the oldest remaining Fabrica in Little Havana, El Titan continues to turnout boutique masterpieces, and this addition to Willy's prolific Curriculum Vitæ, is a prime example. Herrera Estelí Miami line is expertly handcrafted by Level 9 Cuban rollers with a plush Ecuadorian Habano Oscuro wrapper that envelopes a rich Ecuadorian Sumatran binder with select fillers from the Dominican Republic and Nicaragua. Originally released in only one size - a Corona Extra - Herrera Estelí Miami cigars are now offered in the following popular shapes: Lonsdale, Piramide Fino, Robusto Grande, and Short Corona Gorda. The smoke is rich and creamy issuing base notes of earth, pepper, and cedar, You may even notice hints of cocoa and sweet spice in the mix. Presented in boxes of 10, Herrera Estelí Miami cigars are a great way to discover the satisfying flavor and aroma present in every Herrera Estelí cigar. Add a box to your next order.